Let’s face it. Sometimes you just need a little something sweet. The good news is these dessert recipes won’t ruin your diet. In fact, you’ll get a serving of fruit. Enjoy! The best part of this recipe? It’s so easy! Just dip your strawberries in lemon curd and roll them in chopped almonds. Here’s the recipe. Dice up apples, pears and peaches for a quick salsa and mix with cherry concentrate. Then bake tortillas sprinkled with a little cinnamon and sugar to make crisp chips. Kids and adults will love this! Here’s the recipe. This fresh dessert is perfect for adult dinner parties. Garnish with a little mint and voilà. Here’s the recipe. Enjoy this tropical smoothie on a hot summer afternoon instead of ice cream. Here’s the recipe. This is another adults-only recipe (unless you have really adventurous eaters). 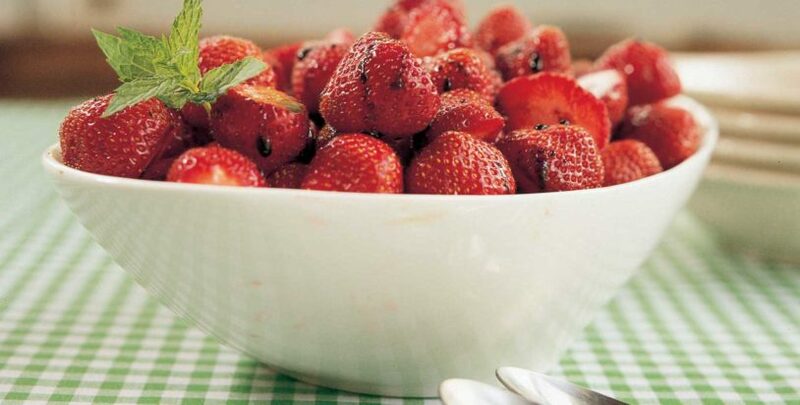 Balsamic vinegar, lemon juice, and a little black pepper give a bowl of strawberries a whole new taste. Here’s the recipe.